A family owned business established in Ireland, at a place known as “Cork” in 1845 and till today runs the 2 outlet by its family members. It has been a local bar for the famous actor Oliver Reed. Healy Mac’s is the first of its kind, establishing its foothold in Kuala Lumpur the capital of Malaysia in 2009, a multi-cultured country in the Asia region. Healy Mac’s Irish Bar and Restaurant provides the best Irish conceptualized ambience with a feel of comfort and satisfaction. The authentic Irish atmosphere experience designed by the Irish family members prides them by being and giving the best in drinks and food to its friend, the “Asian Region”. The family owned business aim is being a local Irish concept provider, with more than 20 years of experience in the Irish Bar. 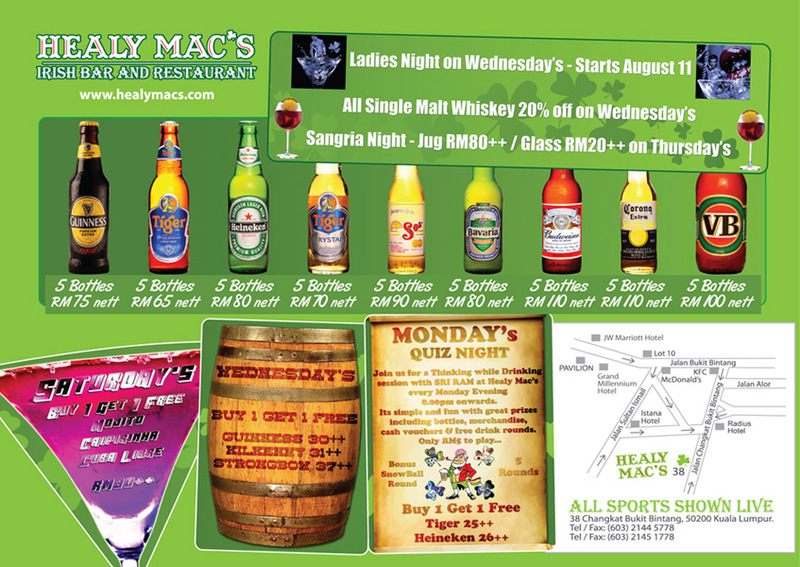 Located in the heart of Kuala Lumpur, Healy Mac’s is one of Kuala Lumpur’s favourite destination for locals and visitors alike. Healy Mac’s is available for private and corporate events with a private upper area and perfect area for private parties, special occasion, corporate functions and meetings. Most of all, it’s a place for all. “All Sports are Shown Live” and its sumptuous meals are specially prepared to its taste by its very own local executive chef. Live Band and all day long happy hours. Be greeted with our warm team who pride themselves with quality and service. Come visit us to experience Irish hospitality. Their pub in Ireland, O’ Brien’s Bar Churchtown Co. Cork has been in their family for over 150 years, it’s a famous little bar in a famous little village in North Cork. One of the most famous costumers was the late OLIVER REED (actor) who made it his local for the last number of years of his life. He loved the village and the people so much that he was layed to rest just 50 meters from the Pub. Churchtown, in also the birthplace of VINCENT O’ BRIEN one of the worlds most famous horse trainers.